MELBOURNE, Fla., June 8, 2011 -- Friday the 13 th was anything but unlucky for the United Service Organizations (USO) as hundreds of employees from Northrop Grumman Corporation (NYSE:NOC) provided the USO with 10,060 care packages for deploying service members. "I was told once, you don't have to wear a uniform to be a patriot, what you do everyday shows you are proud patriots and we thank you for your support of the USO," said Dale Burton, Melbourne site manager and vice president of the Intelligence Surveillance and Reconnaissance and Battle Management Command and Control division of Northrop Grumman's Aerospace Systems sector, to employees. "When you look around our hanger and see all the banners of different weapon systems we work on, we know who we work for, our servicemen and women." 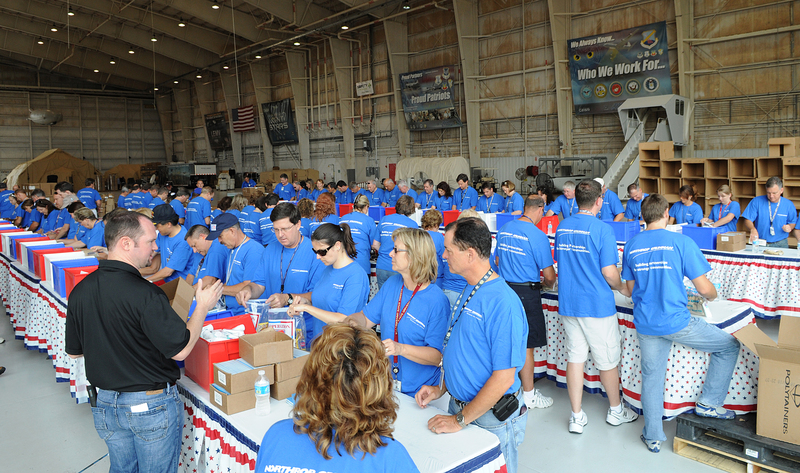 Northrop Grumman employees spent the day stuffing sunscreen, packaged body wipes, granola snacks, playing cards, prepaid phone cards, disposable razors and chewing gum into portable kits that will be shipped all over the United States in preparation for service members deployment. Northrop Grumman employees have a long history of supporting the USO, not just through "stuffing" parties, but other fundraisers activities throughout the year. The Melbourne site raised more than $7,000 from USO fund-raising activities since the beginning of this year. Also attending the USO event to help stuff packages was U.S. Air Force Maj. Jason Ford, commander of the Melbourne Defense Contract Management Agency (DCMA), along with several DCMA employees. "The USO is as relevant today as it was when it started in 1941," said Maj. Ford. "The fact that you are all here, shows you go above and beyond the minimum that is required and you are the patriots that this nation needs." 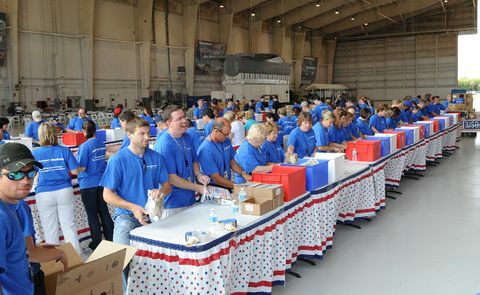 The USO recently celebrated the stuffing of its 2,000,000 care package in December 2010. On average, Operation USO Care Package distributes anywhere from 250,000 to 300,000 care packages each year. Since 2010, Northrop Grumman has been the corporate sponsor for the USO Military Bowl presented by Northrop Grumman. This year's game is expected to feature the U.S. Naval Academy against an Atlantic Coast Conference (ACC) team and will be held on Dec. 28, 2011, at 4:30 p.m. ET at RFK Stadium in Washington, D.C. The Military Bowl seeks to generate broad support for the USO, positively impact the regional economy, and honor the U.S. military and their families.